Have you ever thought of making yourself a Mary Poppins-like-Carpet-Bag? Or two, or three? Well, I have for sure! For more then one reason. Because all the scraps of fabrics that you might have left over from previous projects (I have bins and bins full….shhh) can be enough to make a Carpet Bag. So it’s not that you need a new bag right (wink, wink), but it IS a nice zero-waste solution! And, Miss Poppins happens to be very ‘vintage inpired’. See, the original Carpet Bags come from the late 19th century. Where train travelers first traveled with a suitcase, a new trend emerged of ‘travel bags’ such as duffel bags, but also Carpet Bags. Which owes it’s name to the fact that they were made from leftover carpet. A historic example of a sustainable zero-waste practice. In the sixties this bag became very popular as the famous nanny Mary Poppins carried her magical Carpet Bag everywhere she went. So she was vintage inpired herself back then already! 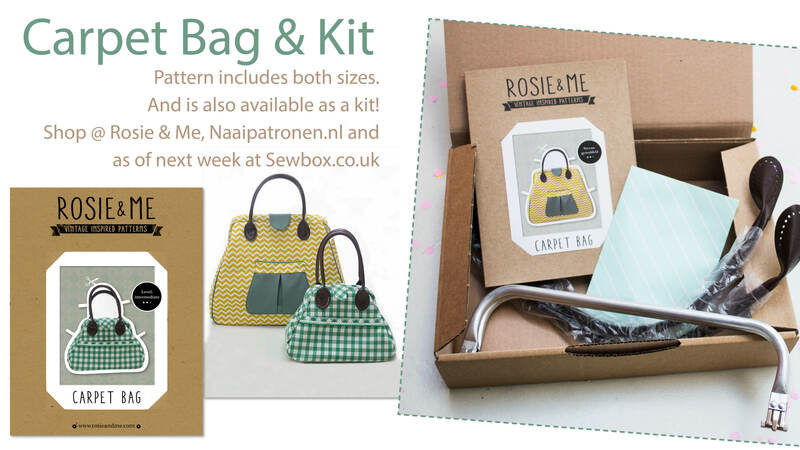 Thereafter I got inpsired by her sixties bag and decided to draft a pattern with a contemporary Rosie & Me look. Except, it was not easy to find the oh so recognizable tube closure. Therefore, I decided to offer a kit with both the pattern and the hardware, including the possibility to re-order the unique hardware. The one thing that I did not include in the kit is your creativity. Because that is the fun part of ‘designing something yourself’! Which fabric, color, print, lining, with or without piping, lace, buttons… Or? … Well, you name it! Like I mentioned earlier, you can use scraps of fabric you still have, but old curtains from the thrift store or a wool blanket from for example your grandmother can also make the perfect Carpet Bag. However, an authenetic Carpet Bag which is actually made from carpet is something I would not recommend. This would be quite difficult to sew…. What are the sizes of the carpet bags? How long are the metal frames? I hope this helps! Once again apologies for the delay. Please let me know if I can help out in any other way!